Some mammal species are endowed with tusks -- oversized teeth that grow to conspicuous lengths. Tusks are made out of a durable, easy-to-carve type of dentine called ivory. Tusks serve a variety of functions, including self-defense, competition with members of the same species, food gathering and even locomotion. To protect species heavily hunted for their tusks, the 1990 Convention on International Trade in Endangered Species made ivory trading illegal. A pair of ever-growing tusks helps elephants dig for water during droughts, scrape bark off trees for food and defend themselves against predators and other elephants. Despite their usefulness, the tusks -- which, in the elephant's case, are overgrown incisor teeth -- make the planet's largest terrestrial creature attractive to poachers, who covet their ivory due to its high commercial value. Both female and male African elephants have tusks. In Asian elephants, most males possess tusks, while those of females are much smaller or nonexistent. 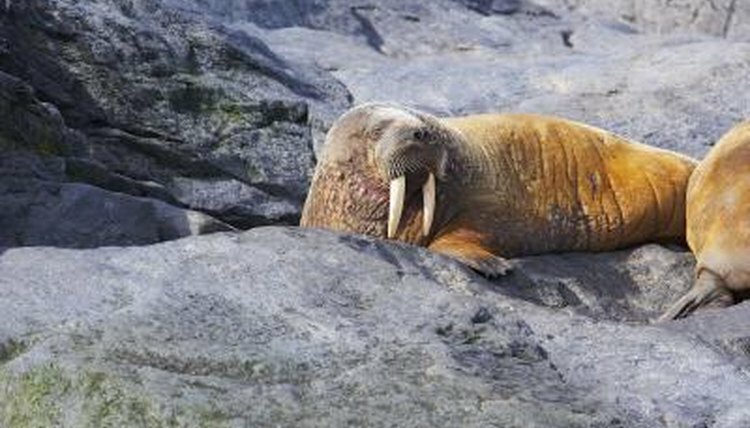 The Arctic-dwelling walrus belongs to a group of aquatic mammals known as pinnipeds, meaning "flipper-footed." Walruses may weigh up to 1.5 tons and are the only pinnipeds with a pair of straight, downward-facing tusks that grow continuously throughout the animals' lives. Both male and female walruses possess tusks, which in their case are enlarged canine teeth. Walruses use their tusks to hoist themselves out of the water in a behavior known as "tooth-walking." When submerged, walruses may use their tusks to penetrate ice above them to create breathing holes. Male walruses also use their tusks to defend their mates and territories from other bulls. Wild swine, such as the warthog, a speedy pig found throughout much of Africa, often have four tusks. Warthogs have two severely curved upper tusks, used when battling other males for the right to mate with a female, as well as two shorter, sharper lower tusks for self-defense. Two pairs of tusks are also the most noticeable features of male babirusas, found on the island of Sulawesi. Babirusa is Malay for "pig-deer," a moniker that refers to this species' antler-like upper tusks, which curve back and down to shield the animal's eyes. The babirusa sharpens its lower tusks, used in battle with rival males, by rubbing them on tree bark. The elusive narwhal, a whale found in Arctic waters, has been dubbed the "unicorn of the ocean" on account of a single straight, spiraled tusk that protrudes from its upper jaw. Only male narwhals have noticeable tusks, which can be more than 8 feet long; those of females are small or completely absent. Scientists theorize the sword-like organ is meant to impress females during mating rituals and to fight off other males vying for the same mate. The lower incisor teeth of hippopotamuses, the heaviest of land animals, never stop growing and are considered tusks. These aggressive animals use their tusks in combat with other hippos and for self-defense from predators. Hippo ivory is much more malleable than elephant ivory, so poachers also target hippos for their tusks.